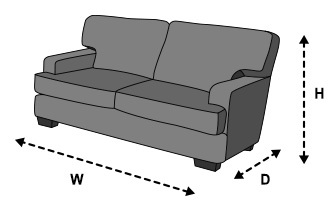 If you’re buying new furniture it’s important to get your room measurements ready before you order. We give full measurements for every piece of furniture we sell, making it easier for you to determine whether it will fit and complement your space. The measurements are given as follows: HxWxDcm or LxWxHcm. Certain furniture items are delivered fully assembled so it’s important that the furniture is in proportion to the rest of the room and can be carried to its desired location. Make a note of the furniture’s largest dimensions and check that it will fit comfortably through any doorways, hallways and up any stairs without damaging paintwork or windows. A useful way to check whether your furniture will fit in a particular room or space is to map out your space using masking tape or newspaper. Always make sure you have enough space to walk around your furniture. With dining tables you need to ensure you have at least 60cm (24in) clearance from the chair when it’s out from the table to sit comfortably. If you are replacing older furniture with new furniture, measure the existing piece to check the difference in size. Mark out the area of the new piece on your floor with newspaper or masking tape. Our delivery team cannot take out any windows or doors to enable delivery. If the delivery team cannot get the piece into your house, they’ll have to take it away again. This is at the customer's expense.